The unique extraction system featured in the PAL-2R allows the light fitting to be removed from the pool with no tools. 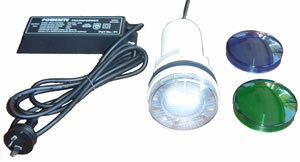 For complete order details on the PAL-2R and PAL underwater light accessories available, click here. 1. Locate the position for mounting the PAL-2R fitting at the centre of one end of the pool or the centre of both ends if required. If the pool is an irregular shape the fitting should be located in a position to obtain the best light spread in the pool. The fitting should be placed 300mm below the water level or 450mm below the top of the pool to enable the retractable part of the fitting to be taken out of the pool if the lamp in the PAL has to be replaced. 2. Drill a 60mm mounting hole (60mm to 65mm) at the selected location. After the hole is cut out, clean the area around the hole to remove rough spots and dust. 3. Fit the PAL fitting in the hole ensuring the rubber seal is fitted at the between the back of fitting and the pool/spa wall as shown in the diagram. Place a bead of silicon between the nut and the wall then tighten up the nut firmly. 4. The PAL Transformer is IP64 and can be mounted in the pool zone. Find a suitable position to mount the transformer ensuring it is a minimum of 1.2m above the maximum water level and the transformer must be installed to comply with AS3000. 1. Remove the "Clip-On" Lens Cover on the PAL-2R and twist the body in a anti-clockwise direction to retract the fitting from the housing. 3. Replace the Lamp. Note: To ensure reliable operation of your PAL it is essential to use a genuine PAL-2R Lamp/Seal Replacement kit part no. 39-2DL50 or FNV/CG 50 watt Xenon Lamp with UV Cover Glass. When the Lamp is replaced it is recommended to maintain the water tight seal that the "O" ring be also replaced, the "O" ring seal is supplied with the Lamp/Seal replacement kit. 4. When reassembling the PAL-2R fitting ensure the "O" ring is sitting correctly and replace the (6) lens screws and ensure the screws are not overtightened.